The BodyBilt Maestro effortlessly transforms your desk through a range of sitting and standing heights, without sacrificing aesthetics or workspace. 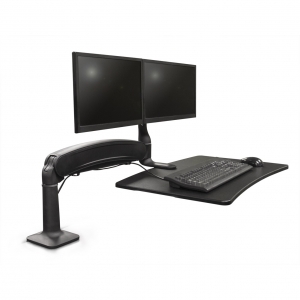 Compatible with almost any desk or work surface, its dual monitor design and impressive 18.5” height range provides an ideal sit-stand experience for nearly every user. 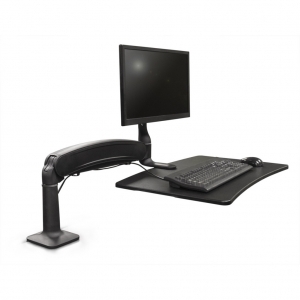 A generous 28” by 18” platform accommodates keyboard, mouse and more, while swinging easily out of the way when not in use – or it can be positioned flush to the desk. With built-in cable management, the Maestro builds height adjustment into your workstation while keeping your work surface clutter-free. Download the files below to learn more about the BodyBilt Maestro. Without sacrificing workspace, the BodyBilt Maestro lets you easily take any desk or table from sitting to standing height without sacrificing workspace. Th BodyBilt’s mid-back task chair, with a tall cylinder, adjustable arms, moderately contoured seatpan, center pivot mechanism, and a chrome, height adjustable footring. 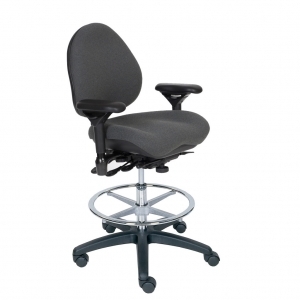 The R2507 Ergonomic Chair is a high back task chair that has a moderately curved seat developed to advance effective ergonomic posture that supports healthy bodyweight dispersion for the seated professional. The R2507 chair is an excellent choice for every day tasking, with pressure relieving contours and 10-point adjustability.